Every Thursday afternoon, Le Frigo Vert, a cooperative and café, hosts a pay-what-you-can café alongside a series of workshops on creating sustainable foods and cosmetic products. On March 7, the PWYC café featured a workshop hosted by Marli Santos. Le Frigo Vert sources their workshop facilitators, like Santos, from a network of people who have previously given workshops at the People’s Potato or the Concordia Student Union. After being diagnosed with breast cancer, Santos felt that she wasn’t eating her best, and that a change in her diet would greatly improved her quality of life. A big part of that change was introducing probiotics, or healthy bacteria, into her diet. She began experimenting with kefir, a fermented milk drink, and then kombucha. She has been sharing her passion for fermentation ever since. 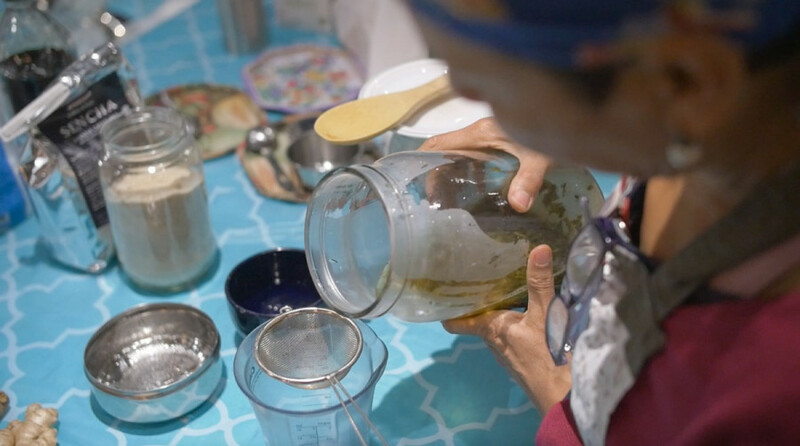 Participants were asked to bring a 500 mm jar to the workshop to transport their SCOBY—short for symbiotic colony of bacteria and yeast, and what kickstarts the fermentation process—home with them. Santos provided participants with their very own SCOBY, and demonstrated how to make kombucha at home. The workshop started with highlighting the steps to take leading to the first stage of fermentation. Santos stressed the importance of keeping everything clean, especially at this stage. This helps to avoid contaminating the good bacteria in your kombucha with any bad bacteria. To begin, you start off by brewing the tea in the bottled water. Once brewed, you add the sugar, cold water, and mature kombucha. After that, you simply add the SCOBY and leave it to ferment covered with a thin cloth at room temperature for about 10 to 14 days. Now comes the fun part. Once you put your kombucha through the initial fermentation process, you can either drink it as is, or start a second process, which is where you can get creative. Santos passed around several different recipes, each featuring different flavours and having been fermented for different lengths of time, including one that was grape flavoured and was fermented for seven days at room temperature followed by three and a half months in the fridge. The longer you leave your kombucha to ferment in phase two, the less sweet and more fizzy it becomes, Santos explained. Santos also shared a personal recipe to the class, developed especially for this workshop. By adding one cup of hibiscus tea, a couple of tablespoons of maple syrup, some ginger juice, and one cup of natural juice (apple works fine), to two cups from your first batch of kombucha, you get a tasty probiotic beverage you can drink within just a couple of days. If you prefer a sweeter kombucha, a few days of fermentation is just fine. If you like something a little less sweet, with more bubbles, you can leave it to ferment longer. And the ingredients she uses aren’t just for flavour. 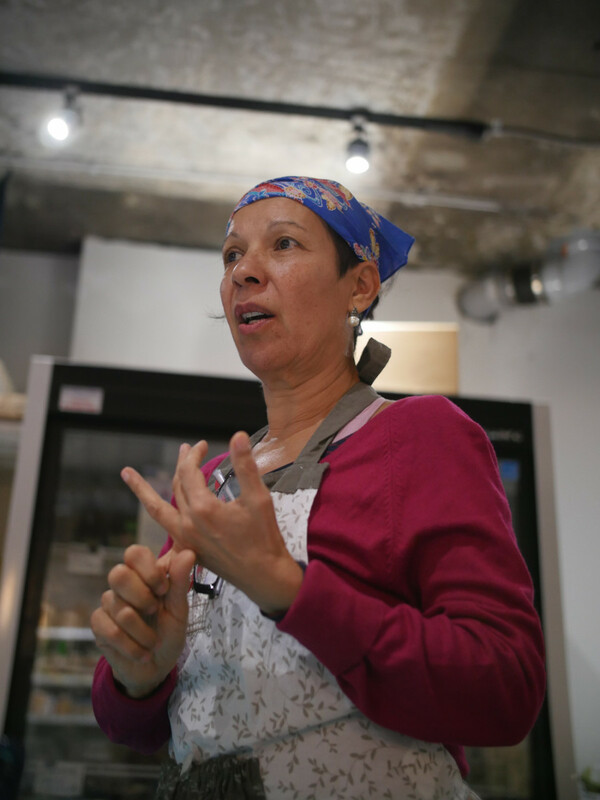 Santos explained that when making kombucha, she always blesses it with reiki energy—a form of alternative medicine focused around energy healing. The Link also made a video of the workshop, you can watch it here. For more information about Le Frigo Vert workshops, check out their” Facebook page”:https://www.facebook.com/lefrigo.vert/.